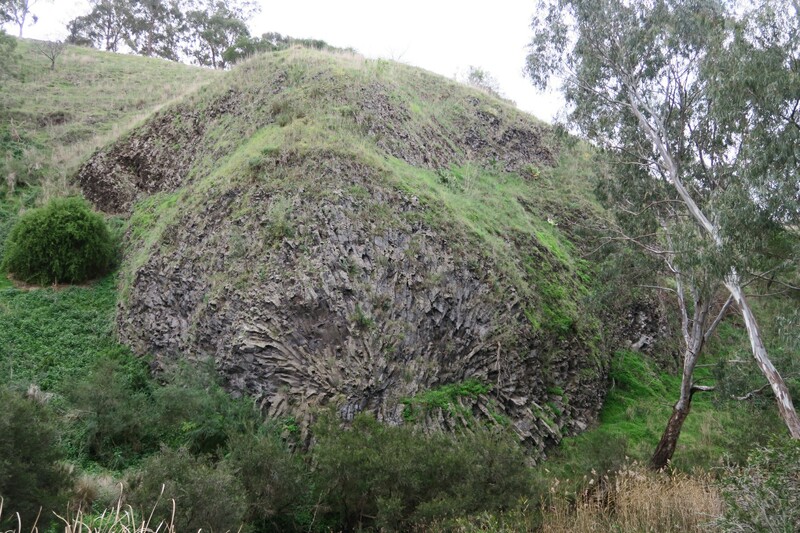 Following on from Trentham Falls, I discovered that not far from Melbourne, there is even more evidence of our volcanic history. After unsuccessful attempts in Iceland to find the “church floor” at the almost unpronounceable Kirkjubæjarklaustur, it was to my surprise to find that we have our very own! 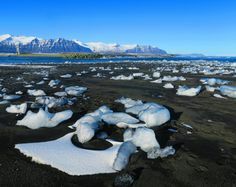 (If you would like a clue on Icelandic pronunciations, check out my short post on it) Located just 20km from Melbourne, it is in fact one of the world’s largest lava flows. For those of you local to Melbourne, it is Keilor Plains! Who would have thought . . . . .Volcanoes from Sunbury formed these plains and they are pretty flat except for where we were going to visit – the Organ Pipes National Park. Walking trail down into the valley. Although the gravel path is wide enough to accommodate cars, it is not open to public access except on foot. Jacksons Creek with basalt structures to the right. Walking downstream, there is more to see as well. 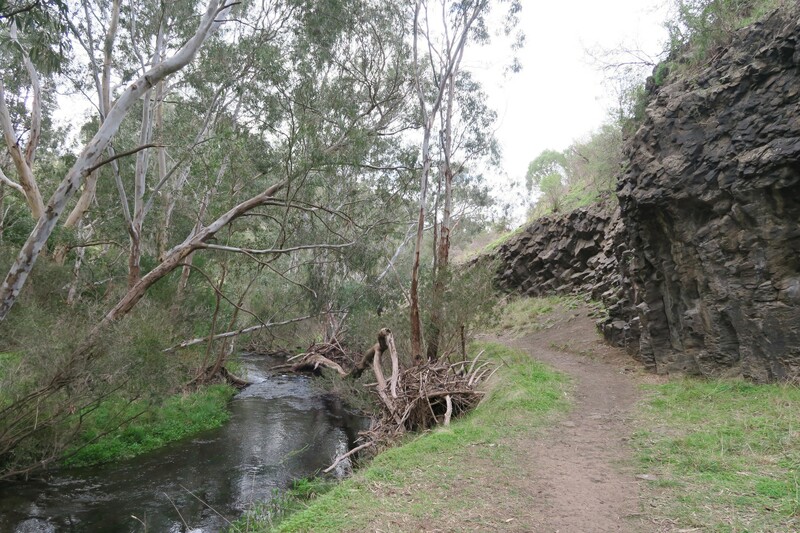 About three hundred metres away you will see from a platform the Rosette Rock across the creek. It is a massive radial array of basalt columns like the spokes of a wheel. It looked like something frozen in time. To Peter, it looked like Iceman had saved a tiny village in Keilor from red hot molten lava by freezing it instantly with his super icy blast, stopping its progress dead in its tracks! 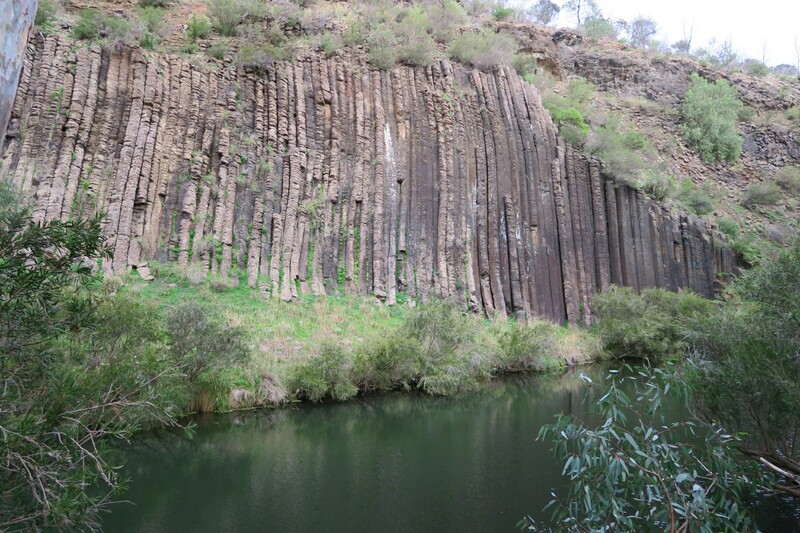 Walking further, about four hundred metres downstream, we finally came to the namesake of the national park, the Organ Pipes. 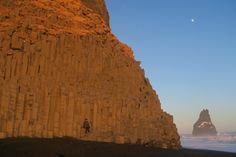 These columns were formed by lava running at right angles to the creek about a million years ago. 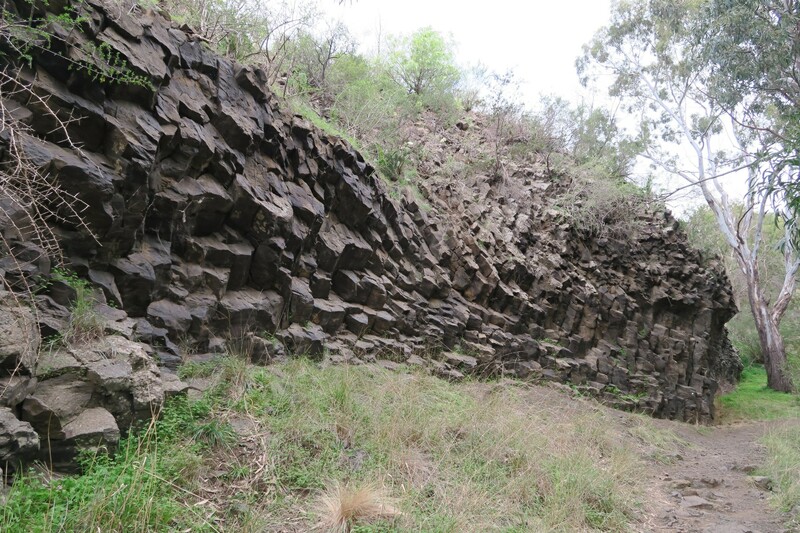 It eventually cooled under the surface crust and as it continued to harden, the basalt mass was formed into columns. 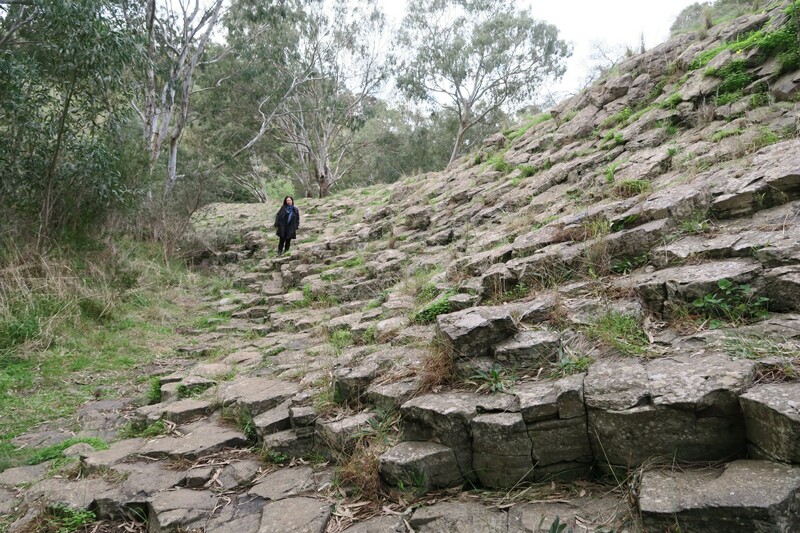 Since then, Jacksons Creek has cut into this structure and over the years the deepening valley revealed the Organ Pipes. These columns are quite a sight and rises some 20 metres (66 feet) high. We actually wanted to get closer but with the creek in between us, there was no way we could get across without getting wet. Nevertheless, it was still a great view. At the end of the day, we thought the National park is a great day trip for visitors. 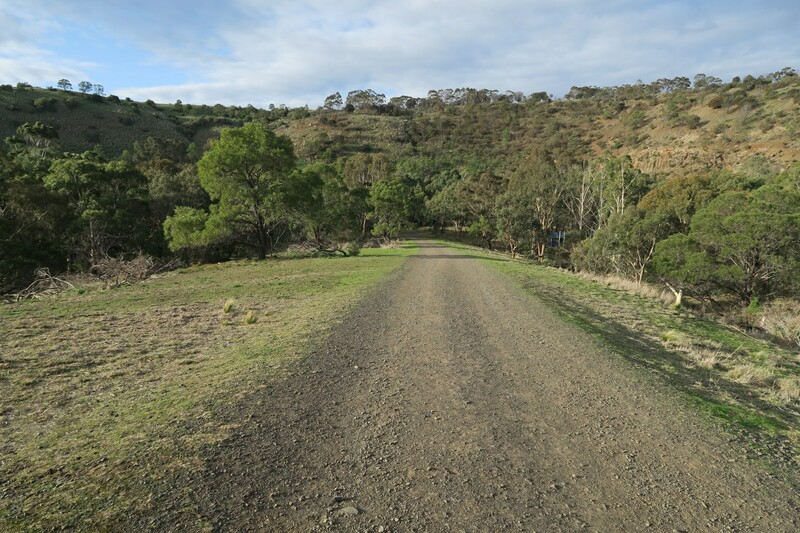 There is no entry fee and with plenty of revegetation work done, it is a good representation of Australian bush land. According to the park information, possums, wallabies and echidnas can sometimes be seen. Skinks and blue-tongue lizards are common and native birds have increased greatly since the park was established in 1972. 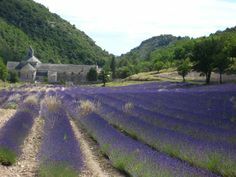 If you are ever in the area and fancy a pit stop, it is worth the couple of hours to spend here. Most interesting! Thanks for doing the leg work and photography. Thanks Anne. It was quite fun actually discovering these places. Very interesting. 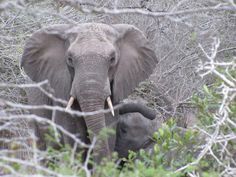 You are right, sometimes we travel far to see sights only to find that there are amazing things to see right in our back yard. Great photos! Wonderful share of your adventure. Thank you. And apparently there are lots more which I am beginning to appreciate! Great photos. There’s a formation like this in Australia called Sawn Rocks. Just looked it up. So cool! Only in neigbourly NSW too. 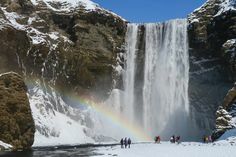 So straight onto my list when I next visit! Hehe. Thanks for the tip.